Former Sen. Chuck Hagel told the Senate Armed Services Committee that the Pentagon is developing space weapons in response to China’s anti-satellites missiles and working to bolster defenses against Chinese cyber attacks. Hagel also stated in written responses to questions posed by the Senate Armed Services Committee that al Qaeda-linked terrorists were behind the killings of four Americans in Benghazi. But he repeated earlier Obama administration statements that al Qaeda is near "strategic defeat" despite its continuing attacks and growing presence in the Middle East and North Africa. On China, the committee asked Hagel if the United States should develop space weapons in response to China’s development of anti-satellite missiles and other "counterspace" weaponry. Hagel said as defense secretary he would continue to implement the 2011 national space strategy that calls for avoiding hostilities in space. However, Hagel stated that current space policy "directs the secretary of defense to develop capabilities, plans and options to deter, defend against, and, if necessary, defeat efforts to interfere with or attack U.S. or allied space systems." The statement is one of the first clear indications that the Pentagon is preparing for space warfare. The U.S. military was jolted by China’s 2007 test of an anti-satellite missile that destroyed a Chinese weather satellite and left tens of thousands of pieces of debris in orbit. The high-speed space junk threatens manned and unmanned satellites. Defense officials say that with an arsenal of two dozen anti-satellite missiles China’s military could severely disrupt U.S. ability to communicate, gather intelligence, and direct precision weaponry. Hagel, a supporter of international arms agreements, also said in his written comments that he favors the administration’s plan announced last year to seek a non-binding international agreement on a "space code of conduct." The Joint Chiefs of Staff stated in an assessment last year of a draft code of conduct for space that adhering to such an agreement would hamper U.S. military space operations in several areas. Hagel also offered cautious assessments of Beijing’s growing military but said Chinese cyber espionage and cyber theft has threatened U.S. military advantages. A U.S. counterintelligence report made public last year described a massive campaign by China to steal technology and other intellectual property from the United States through cyber space. Asked about the report, Hagel said: "I believe that the theft of intellectual property and other sensitive information threatens the United States’ military advantage and economic prosperity." "If confirmed, I will work within the department and with other departments and agencies to address this threat," he said. Hagel said he was not in a position to recommend specific actions to deter China from cyber attacks in the future. But he said the Pentagon "is enhancing its cyber defense programs and those of certain defense industrial base networks, as well as improving its ability to identify the origins of intrusion." "If confirmed, I will consider what diplomatic and public engagement as well as other actions that should be taken to address this challenge," he said. Hagel also said he plans to continue the current U.S. military pivot to Asia that includes bolstering alliances and building up military capabilities in the region. He called for continued monitoring of China’s military buildup and pressing Beijing to be more open about its military activities. "The U.S. response to China’s military modernization should be flexible and supported by the continued evolution of our presence and force posture in the Asia-Pacific region, the strengthening of our regional alliances and partnerships, the maintenance of our global presence and access, and the modernization of our own capabilities in such areas as countering efforts to deny us access and freedom of action," he said. The former senator also said he would seek to expand the on-again, off-again U.S.-China military exchange program that Beijing has cut off several times to protest U.S. arms sales to democratic Taiwan. On al Qaeda, Hagel was asked if he believes that the terror group is close to defeat after recent attacks in Benghazi and in Algeria. "Our sustained military, intelligence, and diplomatic efforts over the last ten years have brought us closer to the strategic defeat of core al Qaeda," Hagel said. "There can be no doubt, however, that al Qaeda and associated forces remain potent, dangerous, and adaptable foes—as evidenced by its despicable actions in Benghazi and more recently in Algeria." Hagel’s comments, which were prepared in close coordination with defense officials, were the first by the Obama administration linking the Sept. 11 attack on a U.S. diplomatic compound in Benghazi to al Qaeda. Secretary of State Hillary Clinton last week told Congress that although terrorists carried out the attack, it was not clear that al Qaeda specifically was behind it. U.S. officials have said the al Qaeda-affiliated group Ansar al Sharia was behind the attack that killed U.S. Ambassador to Libya Christopher Stephen and three other Americans, including two former Navy SEALs. 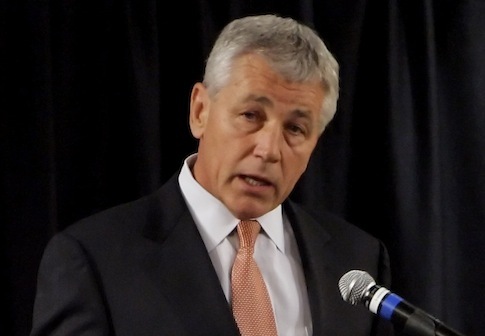 Defeating al Qaeda and associated groups will be a continued focus of the Pentagon if he is confirmed for the defense secretary post, Hagel said. On the threat to the U.S. homeland, Hagel said the threat is "significantly diminished over the past four years." "At the same time, al Qaeda’s remaining leadership in Pakistan and al Qaeda in the Arabian Peninsula remains of serious concern," he said. "Additionally, the Arab Spring has created new opportunities for al Qaeda affiliates in Syria and North Africa." This entry was posted in Politics and tagged Benghazi, China, Chuck Hagel, Obama Administration. Bookmark the permalink.